From these websites: "The ancient and sovereign feudal Barony of Caux was granted to Hugo le Corbeau in the Pays de Caux by William son of Rollo, Duke of Normandie in 1040 CE. "The Barony was confirmed on his son Roger FitzCorbet in Shropshire by William son of Rollo, Duke of Normandie and King of England in 1069 CE. "The sovereign status of the Barony, free of royal oversight of Baronial affairs, was reconfirmed on his grandson William Corbet in Shropshire by Henry II, Count of Anjou and Pretender to the Throne of England in 1165 CE. 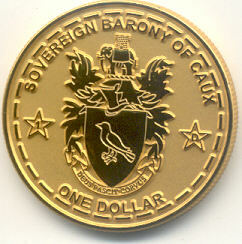 "The Sovereign Barony of Caux (SBC) was restituted on August 27, 2001 CE, by His Lordship, John I, first and thirty-seventh Baron of Caux, of the Corbet family." The family's history begins with Hugo le Corbet or le Corbeau. With two of his sons, Roger and Robert, Sir Hugo joined in the battle of Hastings with William the Conqueror in 1066. Hugo helped counsel the Conqueror in regards to the Welsh border lands which were unconquerable. For their service as knights to the Conqueror, Robert and Roger were given Baronies. Roger received twenty-five manors in Shropshire (The Barony of Caux). Robert received a grant of fifteen manors in Shropshire (the Barony of Longden). These Manors had been townships under Saxon rule. Roger called both his castle and Barony "Caux" or "Caus" after his home in Normandie. The Corbets owed fealty to the Earl Roger de Montgomery. They were in sovereign service to help control the borders of Wales, with absolute local authority over their demesnes. The Shropshire manors were granted to the Corbet brothers in 1069 CE by the Conqueror, and were reconfirmed by his son William Rufus in 1091 CE. At this time, the Barony (along with several more along the Welsh border) became "Marcher Baronies". Independent and sovereign under the overlordship of the King, they were essentially free states. This sovereign status was reconfirmed on the Barony of Caux in 1165 CE by the Count of Anjou, Henry II, Pretender to the English Throne. The Barony passed to Beatrice Corbet in 1397, and the title was vacated in 1422. The present claim to the Barony dates from 1972, and the Barony was restituted on August 27, 2001 by John I Baron of Caux [Johannes I Corvinus Caux Dominus]. 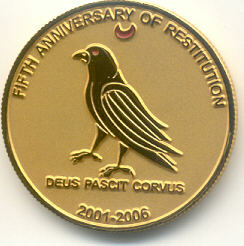 They issued a 1 Dollar Gold plated Silver coin dated 2006 on their 5th Anniversary of restitution.